ETS polymer magazines are gaining in popularity. Elite Tactical Systems (ETS) alternative Glock magazines. From our first post, to our review of the ETS Glock 9mm magazines at SHOT Show this year, we have been very impressed with the quality of manufacturing, and the much more affordable price over standard Glock magazines. Made from extremely durable “advanced polymer”, the ETS magazines have already garnered very positive reviews for their durability and effectiveness. Our own experiences have also been very positive. Editor’s Note: We have an additional review paragraph at the end of the article, detailing our experiences with the ETS Glock 22 magazines. There are several good observations, but a couple of negative discoveries everyone should consider. The new ETS Glock 22 magazines are just the start for the .40 S&W magazines. Elite Tactical Systems introduced themselves to the market by producing alternative polymer magazines for two of the most popular firearms today – the AR-15, and the 9mm Glock pistols. After a brief dispute with Magpul over their follower design, ETS made minor modifications and were ready to hit the market with full force. And the results have been very impressive. Elite Tactical Magazines have been features in several major industry publications, and so far the reviews that have come in have been very positive – including our own. The Glock magazines are translucent, allowing the shooter to make very quick visual round count checks. Made of lightweight “advanced polymer”, the ETS magazines are touted to be so durable that it will withstand fully loaded storage over long periods of time without cracking, and are impervious to extreme heat and cold. The ETS Glock 22 magazines will come standard with a 16-round capacity! Our own experiences with ETS Glock magazines, though limited, were very positive. We were able to fire several 9mm Glock pistols with multiple and various sized ETS magazines. Each magazine performed flawlessly, and proved their durability from 3-4 foot drops to a concrete floor. We have no problem endorsing the Glock 9mm magazines, and look forward to being able to get our hands on the new Glock 22 magazines. As a Glock 22 user on duty, the ETS magazines will be a great addition for training and to supplement duty magazines. ETS Glock 22 Magazine MSRP: $16.99. 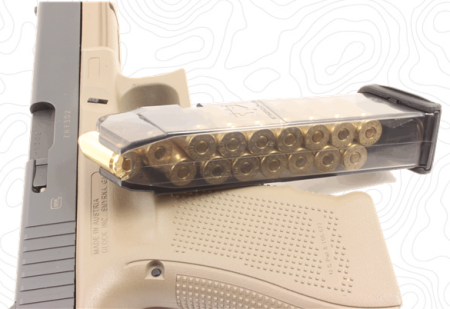 Made of translucent polymer, the ETS magazines provide easy load status. Creep resistant—feed lips and body will not spread during long-term, fully loaded storage. Personally, I am very excited to see the addition of ETS Glock 22 magazines. I have ordered (3) of the new magazines so I can do a more complete review, but I expect to find the same high quality we experienced with the 9mm Glock magazines. As ETS expands the Glock line of magazines, I would not at all be surprised to see them begin expanding into other popular firearms; such as, the 1911, and the most popular .380 pistols. That will likely just be the start. We have had (3) ETS Glock 22 magazines for about a year and a half now. I have been able to shoot with these magazines on several different range training days, from standard competency drills to highly dynamic combat drills. We have found some very good things about these ETS magazines and a few concerning discoveries as well. Shooting was performed with a Gen 3 and Gen 4 Glock 22, and a Gen 3 Glock 23 with similar results. The ETS Glock 22 magazines have held up very well. The “advanced polymer” design has held up to abusive treatment and the magazines have remained intact and functional. This includes numerous drops of about 3 feet onto a concrete floor or gravel. The floor plates barely show sign of use and seem to be just as tight and secure as when new. The magazine springs are still fully functional and have performed nearly flawlessly in feeding. The anti-tilt followers remain intact and have performed well. Anti-tilt followers have performed flawlessly. The one misfeed we experienced came during an off-hand shooting drill and was most likely induced by an improper grip and recoil control. In that event the fired casing was ejected, but the new cartridge got flipped almost straight up causing the slide to catch the cartridge off of the feed ramp locking the slide partially open with the cartridge out of the chamber. I chalk this up to bad grip and not the ETS magazine. There are two areas we have found the ETS magazines did not perform well. The first is relatively minor, but something worth noting. The ETS magazine floor plates have small ridges on the outside of each side designed to assist the shooter with stripping magazines during reloads. Though a good idea and concept, we found in faster paced shooting scenarios this feature did not greatly improve magazine stripping as intended. The ridges are clearly visible and tactile, but in high speed functions (when fine motor skills are reduced), the small ridges just did not have enough gripping space to make a significant impact. The floor plates still remain very close and inline with the pistol grip, and require the shooter to get a full grasp on the floor plate itself to accomplish stripping. Magazines do not eject when empty – requiring concerted stripping. Which leads us to the second area of performance problems that we find to be a near death toll for on-duty use of this ETS magazine. The ETS Glock 22 magazines do not eject well when empty. Despite efforts to wipe down the magazines and magazine well to reduce any fouling, we found the ETS magazines did not budge while attempting to eject them when empty. This required a concerted stripping, with the above mentioned difficulty of having to firmly grasp a good deal of floor plate to accomplish the ejection. In a self-defense shooting scenario we find it unacceptable to have to manually strip an empty magazine before reloading. 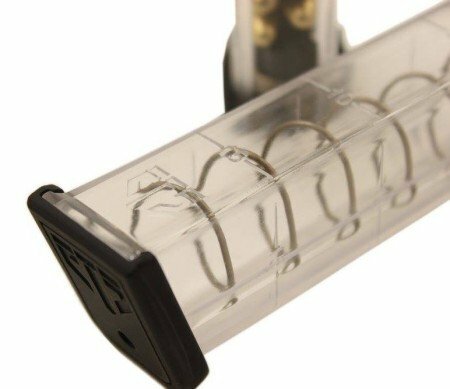 Officers and civilian users should be able to press the magazine release and have the magazine fall freely from the magazine well. At a minimum, users should achieve a partial magazine ejection that releases the magazine from the lock and allows a shooting-hand completion of the ejection either by a wrist flip, or sudden downward motion followed by an abrupt stop. The ETS magazines required the magazine release button to be depressed and the off-hand to manually strip the magazine for removal when empty. This is too time consuming for real-life law enforcement or civilian self-defense shooting incidents, and therefore we cannot endorse the ETS Glock 22 magazines of on-duty use at this time. It appears the dimensions of the ETS Glock 22 magazines are just tight enough to create some friction resistance while inside the magazine well. In addition, one of the best features of the ETS magazines (very lightweight) appears to be contributing to the problem of ejection. The combination of friction, and the very lightweight design, just do not provide the ETS magazines the ability to drop freely once the magazine release is pressed. This appears to be confirmed when partially loaded magazines will at least partially eject upon magazine release activation. More fully loaded magazines often, but not always, will drop freely as the added weight appears to provide enough energy to overcome the friction resistance. 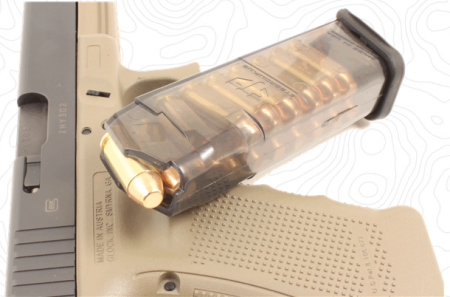 The ETS Glock 22 magazines are well-built, durable, and function well in feeding cartridges as designed. However, the inability to obtain at least partial ejection of unloaded magazines limits these magazines to practice in our opinion.